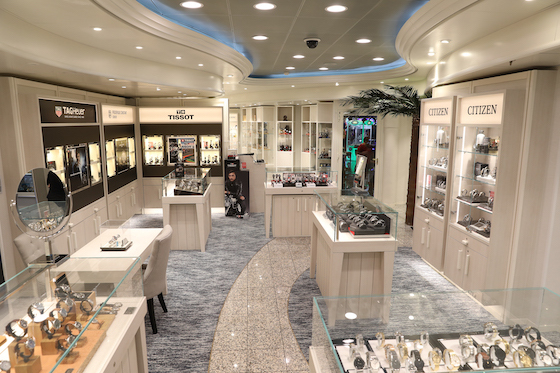 Heinemann’s elegant area for fine watches in its flagship store onboard the Carnival Liberty cruise ship offers a wide as assortment of brands in a range of price points. Gebr. 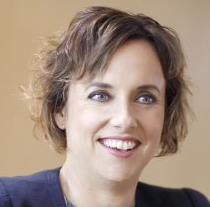 Heinemann entered the American cruise market in early 2018, after winning retail agreements to operate concessions onboard three cruise ships from Carnival Cruise Line in the region — the Carnival Liberty, Carnival Fantasy and Carnival Ecstasy, which sail in the Caribbean — plus one more in Australia, the Carnival Spirit, based in Sydney. Heinemann Americas began operations on the Caribbean bound ships in early 2018, initially taking over older stores it inherited from the previous concessionaire. The company immediately began renovating the shops, to bring in a bright and modern look with a strong sense of place. Following a total renovation of the space on the Carnival Liberty, the first ship on which it began operations, Heinemann revealed its completed new look for the cruise stores this past September. 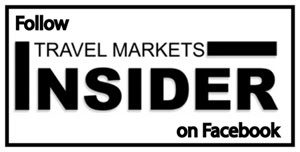 TMI had the opportunity recently to visit Heinemann’s cruise flagship store onboard the Carnival Liberty, a medium-sized 3,000 passenger ship that features 3- and 4-day cruises from Port Canaveral in Florida to Nassau and Freeport in the Bahamas. We were hosted by Nadine Heubel, VP/CEO The Americas for Heinemann, who was closely involved with every step of the renovation. Heinemann operates two large shops onboard the Carnival Liberty, covering a total of more than 2,900 square feet. Using its in-house design team, the company refurbished the stores to bring in a bright and airy Caribbean vibe, opening them up, and converting what was previously a series of small individual stores into one vibrant and appealing space with clean lines along either side of the ship. With light colored walls, multi-level, flowing ceilings, and displays accented in shades that echo the turquoise Caribbean waters, the spaces are very tropical and inviting. Heinemann even added whimsical tropical touches like palm trees. The renovation involved more than just updating the stores, explained Heubel. The rebuilds took place while the ship was filled with passengers and cruising from its home base in Port Canaveral to the Bahamas. “It was very challenging, and we had to do the construction in different phases over a number of weeks. But we are very pleased and proud of the results,” she said. Right in line with Carnival Cruise Line’s “Fun Ship” mantra, the stores’ offerings are in line with what its passengers want. The larger store on the port side features fragrance and cosmetics, fashion jewelry, and a large area devoted to watches in a range of price points. The center of the store features a fine jewelry area operated by Effy. 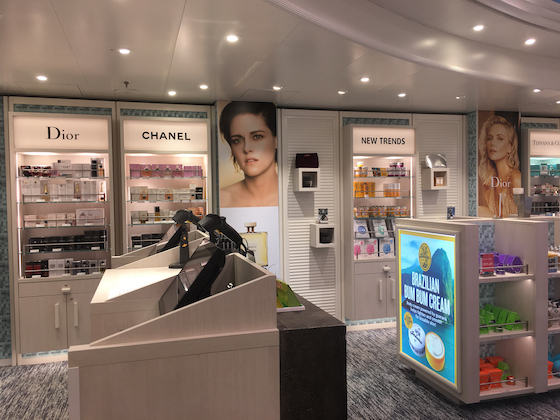 Heinemann has curated a beauty offer onboard Carnival Liberty specifically geared to appeal to the predominantly U.S. passengers. Two of the fashion jewelry brands are new to the Americas cruise market: Coeur de Lion is designed and made in Germany, and Lucia d’Oro is Heinemann’s own brand; both are doing very well, says Heubel. They join the more traditional Swarovski and Alex and Ani lines, which are always crowd pleasers. A nice selection of fragrances range from the best-selling Chanel to a New Trends Bar where Brazilian Bum Bum cream is a current favorite. The watch area offers a very large selection of brands ranging from luxury lines like Frederique Constant, Tissot and TAG Heuer, to more accessibly priced brands like Michael Kors and Invicta, Anne Klein, Seksy and G-Shock, among others. It even carries watches from Shinola, the trendy Detroit-based brand credited with bringing manufacturing jobs back to that city. Most interesting, one of the ship’s best-selling brands are pre-owned Rolex watches through a company called WLXT. Heubel reports that the watches have sold out several times since the store has opened. 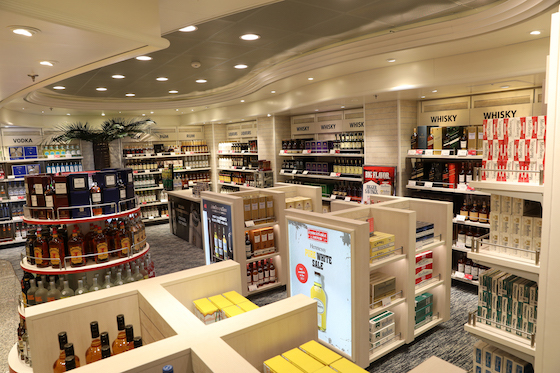 Across on the other side of the ship, Heinemann offers a very broad range of liquor in a slightly smaller store that also carries toys, accessories and sundries. In fact, liquor is the company’s number one selling category, on some voyages generating as much as 50% of total sales, says Heubel. The store makes a point of also carrying brands and running promotions not found in the local market in the U.S. “We have Hennessey, for example, which is not available in the local market, along with full ranges of such top-shelf brands as The Macallan. We offer a full wall of whiskies, and another of rums and vodka, among others,” she said. The extensive liquor selection available on the Carnival Liberty from Heinemann aims to appeal to a broad range of tastes. An authentic Jack Daniel’s barrel takes pride of place along one wall of the store—the Jack that was inside that barrel was bottled exclusively for the Carnival Liberty, and only 1-2 bottles of the stock remain unsold. The barrel was also at the center of a very successful onboard activity where guests were invited to “find the barrel” that was hidden in all sorts of unlikely locations throughout the vessel. Interactive guest activities held outside of the stores are at the heart of many of the retail promotions, says Heubel. In addition to a range of activities tailored to each of the hallmark holidays, there are special brand events. One of the most popular promotions on every cruise is a gala Invicta raffle held on the last day of the cruise, which fills the store and afterwards sells many additional watches, or a recent t-shirt event that sold 4 times the normal amount. Heinemann even employs what it calls a “Promotional Ambassador,” who is in charge of making sure that the promotions are memorable and live up to Carnival’s Fun Ship image, and actively engage with the passenger’s before and during events to assure the guests know what is available. “We don’t want to just sell. We want to make a fun memory and connect it with our brands. We create atmosphere and we make it fun to shop,” said Heubel, who says that sales have steadily risen since Heinemann opened the new stores. Heinemann has also done a major renovation of the shops onboard the Carnival Spirit, based in Australia, but that construction was done while the ship was in dry dock, said Heubel. The company did less extensive renovations on the Carnival Fantasy and Ecstasy.